Opening directly onto one of the most beautiful beaches in Mauritius, Villa Bleue offers your very own stretch of sand where you can lie back and relax as you soak in the gloriously warm tropical sun. Indeed, this spacious villa provides a tranquil haven on the south coast of the island, which is particularly known for its long nature paths, perfect for an idyllic afternoon stroll. As a guest of the villa, you can also enjoy a variety of amenities and services that have been conceived to help you make the most out of your holiday in Paradise Island. 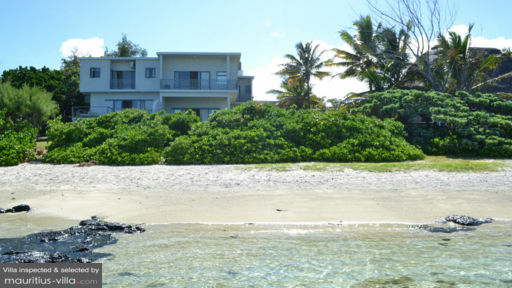 Villa Bleue offers four bedrooms to very comfortably sleep six guests. In the master bedroom, you’ll find a queen-sized bed and an antique-style desk. With a spacious en-suite bathroom, this bedroom also boasts plenty of closet space. The three other guest bedrooms boast a standard double bed each, closets and they all share a bathroom. While the villa is not equipped with a swimming pool, rest assured that you’ll still be able to swim whenever you feel like it thanks to the fact that the ocean is literally on your doorstep. Because it faces the sparkling blue lagoon, you will be able to go for a swim whenever you want. This particular stretch of Pointe d’Esny is also extremely private, which means that you can even take a long nap on the sand if you feel like it. Rest assured that thanks to your proximity to the ocean, you’ll have your very own stretch of beach to enjoy for as long as you want. This villa also has a large tropical garden, complete with outdoors sofas and other outdoors furniture which you can use if you’d like to enjoy an Al Fresco meal. There are also a couple of sun loungers which you can use to work on your tan. 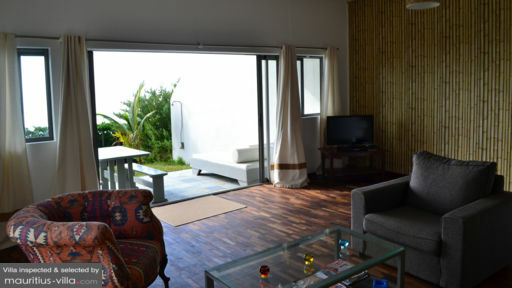 The living areas of Villa Bleue are spread across the ground floor. The living room is beautifully furnished and feels just like home. With a flat-screen television and satellite English and French channels, the living room opens on a spacious patio. 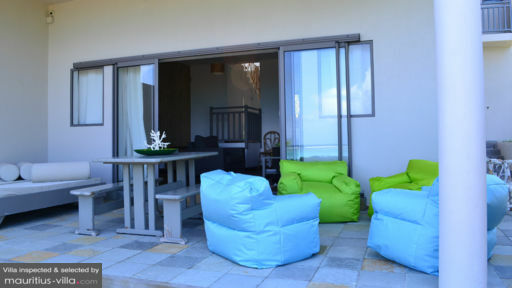 There’s also an outdoor seating area where you can relax and breathe in the balmy night breeze after a day full of Mauritian adventures. There’s also a dining table that can very comfortably seat all the guests in the villa. To ensure that your vacation is as restful and enjoyable as possible, different services have been set up for your convenience. As such, a housekeeper will take care of all the tedious cleaning up. If needed and for an extra fee, the villa can also organize your airport transfer. Upon your arrival, you will be treated to a welcome pack brimming with sugar, coffee, tea, olive oil, dishwasher tablets, soap and shampoo. Rest assured that you’ll never run out of things to do at the villa. Seven minutes away is found the pristine seaside village of Mahebourg which holds plenty of history. This village is also known for its unique waterfront which houses plenty of shops and restaurants. Five minutes away from the villa is found the world-famous Blue Bay Marine Park. While it is an ideal spot for diving, you can also explore its many natural wonders by booking a glass bottom boat.